The remains of the largest contries were forced to create an organization that could repulse the Opposition. Its name was the Alliance. The Alliance's leaders believed that the Opposition's actions would lead to complete destruction of the Earth and dissapearance of humanity. They belived that because of such actions the restoration of civilization in the future would be impossible. The Alliance protected knowledge that was accumulated by humanity during it's existence. It's leaders considered that the humanity should stop that war. 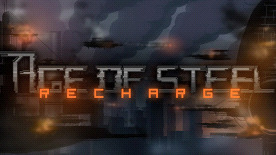 "Age of Steel: Recharge" is a product by Quaint Emerald. All rights belong to their owners and protected by the law.